I like driving, so when it comes to deciding who has to take the wheel on a road trip I’m often the one to jump at the chance. However, my content with driving isn’t the only thing keeping me behind the wheel. I also make an effort to avoid being a passenger simply to get away from having to squish into the backseat. Cars are often designed for the comfort of the driver. A valid point since the driver is the sole operator and the most frequent passenger of a vehicle. However, what about those who aren’t driving, or don’t claim shotgun first? 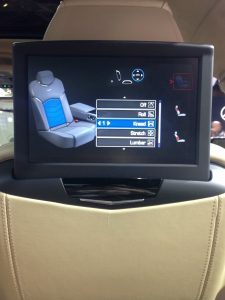 At the 2017 North American International Auto Show in Detroit last week I took the time to explore the comfort of the backseat in the newest and highest quality designs in cars of the year. Many of the varying cars I explored from companies like GM, Ford, Toyota and Volkswagen, have considered the ergonomics of the backseat by providing the option of lumbar seating in not only the front but also the back seats of their vehicles. Some of the more luxury vehicles like the 2017 Camry Sport have even made it standard to include lumbar support in all of their seating. But on my NAIAS adventure, the 2017 Cadillac CT6 Sudan truly stole the show. Not only does the CT6 have lumbar adjustment support in the backseat, it also includes 3.3″ adjustable seating that gives even the “backseaters” the ability to recline and relax. To add to the package, the seats have both heating and cooling options. Now, that’s all fine and dandy, but the feature that really blew me out of the water in this backseat was the massaging seats. With 5 selectable options including settings for rolling, kneading, stretching, lumbar and shoulders, the CT6 definitely took relaxation to a new level. Needless to say, if I ever have the option of taking a road trip in a Cadillac CT6 it’s going to be a tough decision between enjoying the comfort of the luxurious backseat, or experiencing the power of the 3.6L V-6 engine.